A decent budget pen from China with a steel nib. ​Coming in at $55 USD, the TWSBI Diamond 580 is a solid pen. However, its performance is the reason for its relatively low value score. Many steel nibbed pens are able to provide a smooth writing experience for for low prices, such as the Pilot Metropolitan, which comes in at just $15 USD on Amazon.com. With a steel nib, and less-than-durable plastic body and grip section, the pen is of weak build, overall material quality, and is not redeemed by an impressive nib. The only aspect of the pen that galvanizes its value score is the fact that it's one of the few piston filler fountain pens that come in at this price range. As a result, I have to give this Diamond 580 a score of just 6.3/10. ​ The TWSBI 580 Diamond offers a great pistol filler system that consistently holds more than 1.5 mL of ink. 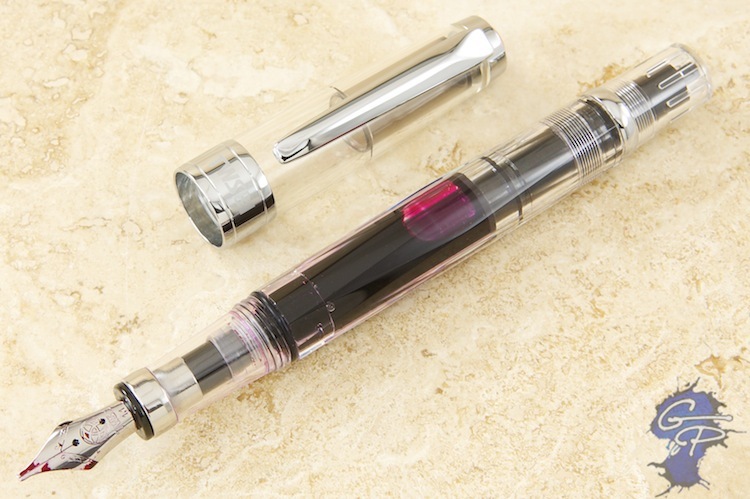 The piston filler is intuitive and easy to use, with a very simple screw system located at the top of the pen. The pen itself is relatively nice to hold due to its balance when not posted; I prefer to use fountain pens this way. The demonstrator body of this pen also benefits the user since it allows for easy viewing of how much ink is left, despite the fact that it does scratch quite easily. ​ The 580 has a smoothness that I would consider to be above-average for its price range; On down-strokes, my unit of the 580 excels with spectacular fluidity, but in all other directions, it falls short, producing noticeable feedback with my Rhodia pad along with an unbearable scratching noise. In general, the writing experience wasn't completely terrible, but it definitely left some to be desired. The resin from which this pen is made from isn't very durable. I've noticed that within my unit, the inside of the cap has cracked within just one year of use; several scratches have also occurred both outside and within the cap. As a result, I wouldn't recommend using this pen as an anywhere pen. The 580 begs for a proper storage, and I now carry it around within a case and sleeve to prevent it from scratching with my other pens. Unlike the ﻿Custom 74﻿, the 580 does not generate noise when force is applied at both ends of the pen. The 74 produces an awful creaking noise under the same conditions. Thankfully, the piston system is robust and effective and I'm able to consistently get full fills with little effort.